Let me tell you about very delicious chocolate chip cookies. 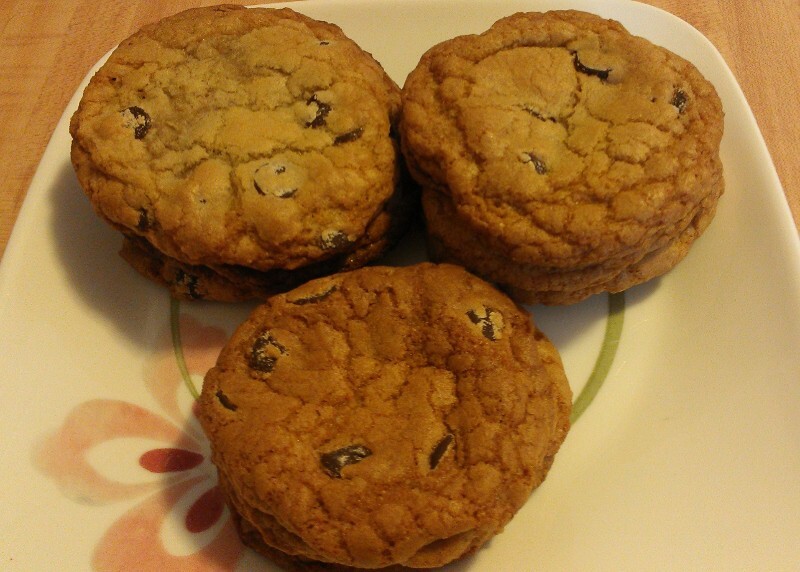 This recipe yields some of the most delicious chocolate chip cookies I have ever made, period. Having made another gluten-free cookie recipe, I think it’s probable that this is the most delicious gluten-free chocolate chip cookie recipe known to man or woman. The first time I made these cookies, I had cut gluten out from my diet for about 3 weeks. I fortunately can and am willing to make a variety of food and to experiment, so I didn’t miss very much. It got easier as the diet progressed, in fact. That said, I have missed classic cookies, and granola bars are a good substitute for only so long. 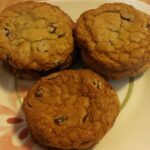 I was incredibly excited when something online led me to Alton Brown’s Chewy Gluten-free Chocolate Chip Cookie recipe. It was the perfect thing to look forward to making on a cold weekend in February – and any time, really. Let me tell you now – this makes excellent cookies that you don’t realize are gluten-free. And, the cookies are huge! I decided to wait until I’d made the recipe again and tried making normal-sized cookies before telling you about it. These were amazingly good cookies. When they were fresh from the oven, Alex said that he wouldn’t know that they were gluten-free. I wouldn’t have known, either. The raw batter, before resting, was a little gritty from the rice flour; the hydrated dough, less so, but not as smooth as cookie dough. Baked cookies had a tiny bit of crunch from the rice flour once they were fully cooled, but no more so than if I’d sprinkled sugar on top of the cookies when I baked them – it didn’t affect the texture at all. I could probably avoid this if I ground the rice flour a little in a food processor. And in fact, I didn’t notice this at all when I made these for a second time. I baked one batch of cookies the full 14 minutes that the recipe called for; they were soft when cool and fresh, but the next day became a nicely crisp cookie with some give in the center. The 12 minute cookies firmed up nicely and were still chewy the next day, although I still expected them to be chewier. Normal-sized cookies were soft for days. The edges of the cookies browned very well on all batches. These were fantastic cookies, and I didn’t feel like I was having to make do with a substitute for what I really wanted. I don’t think anyone would know these were gluten-free if I hadn’t told them. I will definitely make these again and again. Want other good gluten-free desserts? Check out Flourless Peanut Butter Cookies, Chocolate Peanut Butter Bites, Dark Chocolate Macaroons, Mini Chocolate Bundt Cakes, or any sweets from the gluten-free tag. This delicious, gluten-free chocolate chip cookie recipe makes huge chocolate chip cookies that are just as good as ones made with flour. Melt butter. Cream melted butter and sugars with a mixer on medium speed for one minute. Add the egg, egg yolk, milk, and vanilla, and cream until combined (about another minute). Slowly add dry ingredient mixture and mix on low until combined. Stir in chocolate chips. Refrigerate dough for 1 hour until firm, to let all the dry ingredients hydrate. This also helps prevent the cookies from spreading too much. Position your oven racks above and below your middle oven rack position, and preheat oven to 375F. 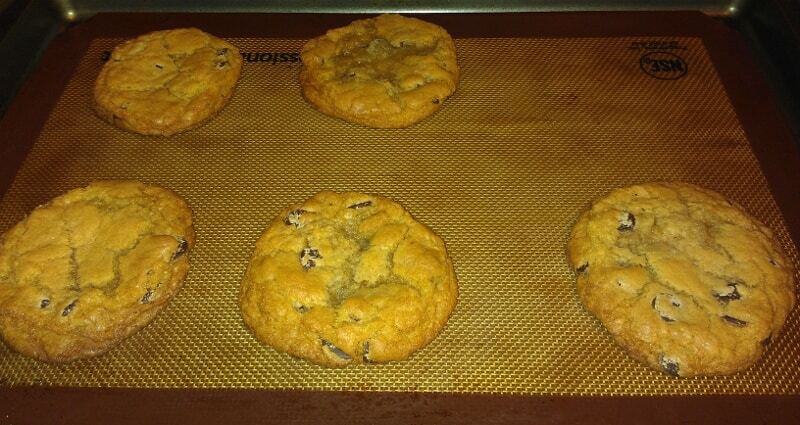 For giant cookies, scoop dough into 2 ounce balls onto parchment-lined baking sheets; I used my 1 ounce scoop and lightly rolled together 2 scoops with my hands. If you use your hands, handle the dough lightly so you don't melt the butter. Space out the cookies so that there are 6 cookies per sheet. Refrigerate the remaining dough while the first batch of cookies bake. Bake 2 sheets at a time for 12 minutes, rotating the pan positions in the oven at 6 minutes so the cookies bake evenly. The recipe says to cool cookies on pans for 2 minutes, then remove to a wire rack. I took a break between batches and cooled the cookies almost completely on the pans; they were incredibly easy to remove that way. If you don't take a break, I suggest removing the parchment from the pans entirely so that the cookies can set, rather than removing the cookies from the parchment entirely. For normal-sized cookies, use a 1 ounce cookie scoop, spacing cookies 12 per sheet. Bake about 9-10 minutes, rotating baking sheets after 5 minutes. I've made these twice. Once I weighed my ingredients, and once I used measuring cups and spoons.